Three Colaiste Dun Iascaigh students took part in a model EU council debate in Dublin Castle recently. This is a very prestigious event. Each of the 28 schools in attendance had to represent an EU country. 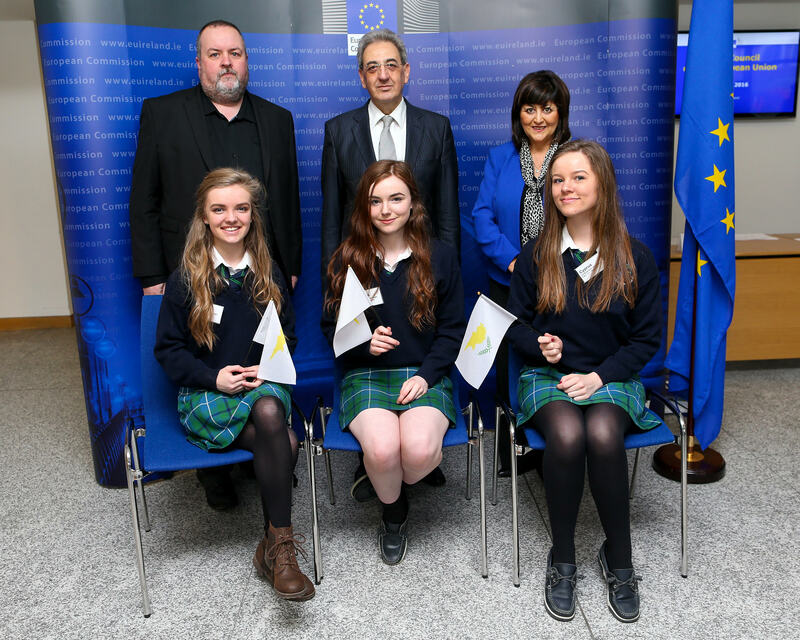 The three girls from the Coláiste represented the Republic of Cyprus. At the ungodly hour of seven o'clock in the morning Amy Carroll, Caitlin Cashman and Samantha Lyons along with their “enthusiastic” supporters (who would prove very useful later in the day with their very amusing tweets) were on the bus up to Dublin castle for the model EU parliament debate. The girls were starving so by the time they reached the castle. At nine thirty they were on the hunt for food. They spotted croissants and immediately darted toward them but the sly Swedish beat them to it. The girls then met the Cypriot ambassador who gave them little goodies bags which even had the flag of the republic of Cyprus in it .they felt like celebrities getting their pictures taken before the debate began. They were then rushed into the rather daunting room where the debate would be taking place they hadn't long to prepare so like true professionals they rooted through their goodie bags! The first part of the debate was opening speeches in which each of the twenty eight countries outlined what it was they wanted in regards to proposal. The lovely Caitlin was in charge of this part of the debate. And it was clear that after her cheeky Greek opening and closing the girls has won the heart of the Cypriot ambassador. During the intense opening speeches Amy (the researcher) and Samantha (the second speaker) took notes furiously. After the opening speeches came the open debate this involved e3ach team explaining why they thought that they and their allies were right and gave them a chance to tell other countries that they were wrong. This was handled by Samantha. Then it was lunch (which did not have enough chocolate cake) during which the girls made allies and agreed to support amendments put forward by Luxembourg the adorable Netherlands and the croissant stealing Sweden. After lunch was basically just making the proposal more flexible so it suit everyone. In the end the proposal was voted in with the girls in favour. They had an amazing day and it was without a doubt one of their favourite moments in TY (not to mention they got free USB's a portable phone chargers out of it) even if they were exhausted after it. The girls say that it is something that they would recommend as they feel they have benefited immensely from it and say that should the opportunity ever present itself jump on it. Pictured is Excellency Mr Costas A. Papademas, Cypriot Ambassador and Barbara Nolan, Head of the European Commission Representation in Ireland. with Teacher John McCarthy, and CDI students.